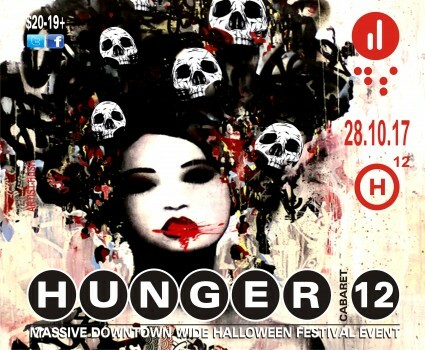 If it’s Halloween, it must be THE HUNGER: Enter the multi-verse of the 12th Anniversary of the largest/wildest music and performance spectacle you’ll ever experience. It comes but once a year-One night-One massive downtown wide Halloween Festival Event. Featuring 50 Performance Acts including 235 Musicians/Performers. So massive an event, it will take up 6 bar venues downtown…Crock’s, Black Pirates Pub, The Foundry, The Sovereign Room, Red Lion Smokehouse and El Tres. Thousands in prizes for Best Costumes at each location for some of the most creative costumes and displays being paraded around and there are many! Pick your story, diabolic or devilicious. Move between bars and interact with every soul along the way, you could even win prizes in the street! One cover of $20 gets you into all 6 venues, feed your hunger and treat yourself to the largest, wildest, slickest Halloween experience x 6…. Receive a Wristband the night of the event with schedule of times and locations for acts, choose what you want to see and hear…You’ll Remember Halloween! THE SOVEREIGN ROOM -They have delicious food, when you need to feed! **Big Prizes for Best Costume at all venues! Big Prizes for Best Costume at all venues! THUNDER BAY ROLLER DERBY CANDY SQUAD-giving out rough & tumble treats-everywhere! BLACK PIRATES PUB -They have delicious food, when you need to feed! EL TRES -They have delicious food, when you need to feed! THE FOUNDRY – They have delicious food, when you need to feed! RED LION SMOKEHOUSE -They have delicious food, when you need to feed! 12:05-12:50- DORAN-[DJ-bass/breaks/underground sounds] w/ ILLUMINATE lighting & glow spinning by The Kidd! PRIZE SPONSORS $6000 in prizes to be awarded! Presented by Definitely Superior Art Gallery; Fundraiser for the Contemporary Arts.